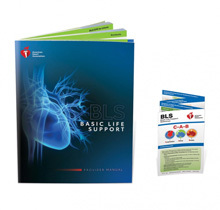 American Heart Association Basic Life Support (BLS) for Healthcare Providers RENEWAL course covers core material such as adult, child and infant CPR (including two-rescuer scenarios and use of the bag mask), foreign-body airway obstruction (choking) and automated external defibrillation. This course is for healthcare providers such as EMS personnel, physician assistants, doctors, dentists, nurses, respiratory therapists, and lifeguards who must have a credential (card) documenting successful completion of a BLS Healthcare Provider CPR course. Please be sure to review your book and skills from your previous CPR classes and bring your old card to class. No Book will be provided, if you lost your book replacement cost is $20 dollars. ShowMeCPR has numerious Renewal Classes. In this classroom-based course, healthcare professionals learn to review and recognize several life-threatening emergencies, provide CPR to victims of all ages, use an AED, and relieve choking in a safe, timely and effective manner. This is a renewal course; participants must have a valid AHA BLS CPR card in their possession on the day of the class. This class is simlar to the BLS Healthcare Provider Course, except course participants must hold a valid or just expired CPR card. This course cost is $55. Cards Issued Same Day. Students must pass a written exam and skills test in order to qualify for a BLS for Healthcare Provider Course Completion Card. Course length depends on class size, most classes are completed in under 4 hours.